The process of incubation takes place like a jigsaw puzzle made up of several elements: temperature, turning, humidity and airflow. If any of the components are missing or do not take place correctly, the product may not meet the desired expectations. 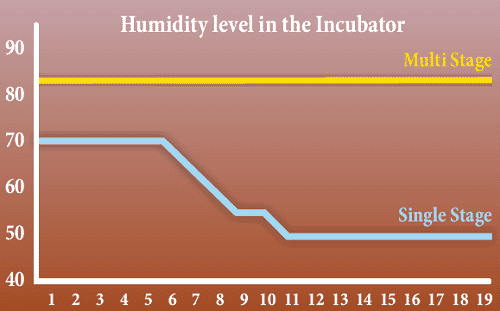 Humidity loss is one of the parameters that should be monitored in order to make adjustments in the incubation process. Obtaining adequate humidity levels in the environment in which eggs are incubated causes embryos to lose water from their interior to the exterior through constant evaporation. Through this process the ideally sized air cell is able to be formed to facilitate the embryo's pipping of the internal membrane between days 19-20. This is the way the transition from chorioallantoic to lung breathing takes place. Additionally a better water and mineral balance is created, contributing to properembryonic development. In order for this to take place, the ideal humidity loss should be between 11% and 13% on day 18 of incubation. Each egg has different characteristics such as size, thickness, the amount of pores and shell conductance. For example, in older flocks the conductance and size of the egg are greater; therefore they should be incubated with higher humidity. It should be remembered that thousands of eggs are handled so they should be grouped in a way that their characteristics be as similar as possible; by flock, age and days in storage. With that, there will be a more uniform environment inside the machine. These observations are evidence if the weight loss is adequate or not, and if the humidity in the hatcher is being handled correctly. This way, corrective measures can be taken. When there is insufficient weight loss, the hatch is difficult; the chick requires more energy expenditure to be able to hatch, causing a weaker chick to be born. On the other hand, an egg that has the ideal weight loss will experience an easier hatch and will spend less time saving energy. Weight loss is not only influenced by moisture in the air, but also by temperature. As the temperature increases, caused by embryonic development and growth, evaporation increases through the shell. Also, the movement of water from the albumin to the sub-embryonic cavity is expanded. On one hand, multi-stage machines keep the temperature and humidity parameters constant during the incubation process because they have 6 sets in the machine with different embryonic states. On the other hand, the single-stage machines adjust to embryonic requirements, reducing the humidity as seen in the Graph below. Moreover, it doesn't have humidity spray, but rather the embryo itself produces the required humidity and this is reduced through damper control to create greater uniformity. A well-sealed single stage machine helps the humidity increase quicker than CO2, which is the reason why the damper can be controlled by humidity. When there are eggs from old breeders the damper will open earlier and when a young flock with low fertility is set, the damper will open later, adapting itself to the characteristics of the flock that is in the setter. To get good weight loss, classification and order must be maintained when handling the eggs in the cool room, checking chick quality, measuring weight loss and adjusting it according to the results. Also, it's important to maintain the machines in good shape in order to have uniformity and balance within the cabinet. 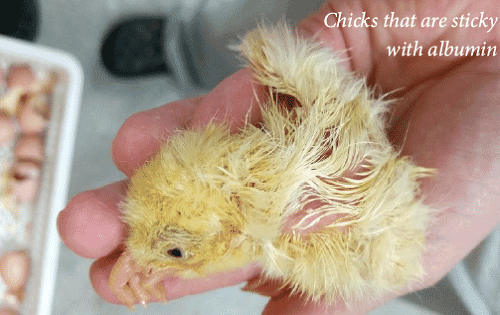 Adequate weight loss offers benefits for embryonic development and in the hatching process, which results in energy savings during the hatch, and in obtaining a chick with excellent potential.